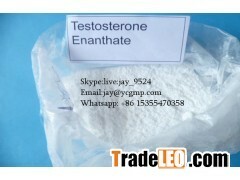 One of the most powerful anabolic steroids throughout human history, Testosterone Enanthate has been used since the early 1930s and continues to be used by elite level athletes and bodybuilders (and your weekend fitness warriors) still today.Testosterone enanthate is a long lasting single ester steroid. It is 7 carbons in length. What this means, is that more of the weight of the steroid is testosterone as opposed to ester weight. When taking a quantity of an esterified steroid, the total weight is a combination of both the ester weight and the steroid. That said, longer esters such as cypionate have more ester weight (due to it's 8 carbon length), and less overall steroid weight. For this reason, enanthate would be preferred over cypionate. Sustanon has even more steroid weight. once administered, serum concentrations of this hormone will rise for several days, and remain markedly elevated for approximately two weeks. It may actually take three weeks for the action of this compound to fully diminish. For medical purposes this is the most widely prescribed testosterone, used regularly to treat cases of hypogonadism and other disorders related to androgen deficiency. Therapy is clearly more comfortable in comparison to an ester like propionate, which requires a much more frequent dosage schedule. This product has also been researched as a possible male birth control options. Tips：This page [Testosterone Enanthate Bodybuilding Anabolic Steroids Chemical Raw Materials CAS 315-37-7] infomation provided by [Hangzhou Fuluo Biological Technology Co,ltd] ,the enterprise is responsible for the authenticity, accuracy and validity of the information content. www.tradeleo.com do not assume any guarantee of joint and several liability. A safe way to suggest that the two sides trade, to ensure the interests of both sides.